The Florida Historical Quarterly has gone Digital! 1845 – William Dunn Moseley was sworn in as the first Governor of the State of Florida on this date. 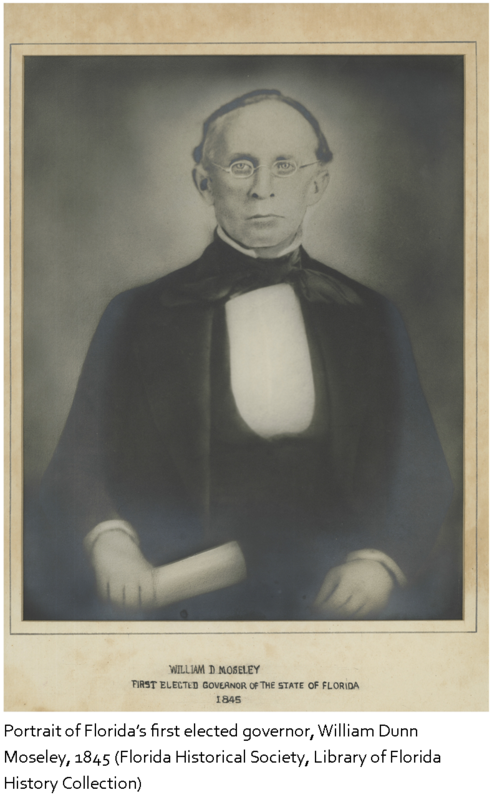 Born in Lenoir County North Carolina in 1795, Moseley graduated from the University of North Carolina Chapel Hill in 1818 and received a Master’s degree in 1821. He served in the North Carolina Senate from 1829-1832 before moving to Jefferson County Florida in 1835. Moseley served in the both the territorial House and Senate before winning the hotly contested 1845 gubernatorial race against former territorial governor and popular Florida politician Richard Keith Call. As governor, he supported the expansion of agricultural endeavors and state funded public schools. He served only one term as governor then moved to Palatka in 1851 where he operated a citrus plantation until his death in 1863. All FHS Members receive our newsletter, The Society Report, a 10% discount in FHS and Museum stores, and early notice of all events, including our Annual Meeting and Symposium! Other benefits vary by member level! Florida Frontiers “Revisiting the Irma Canoe"